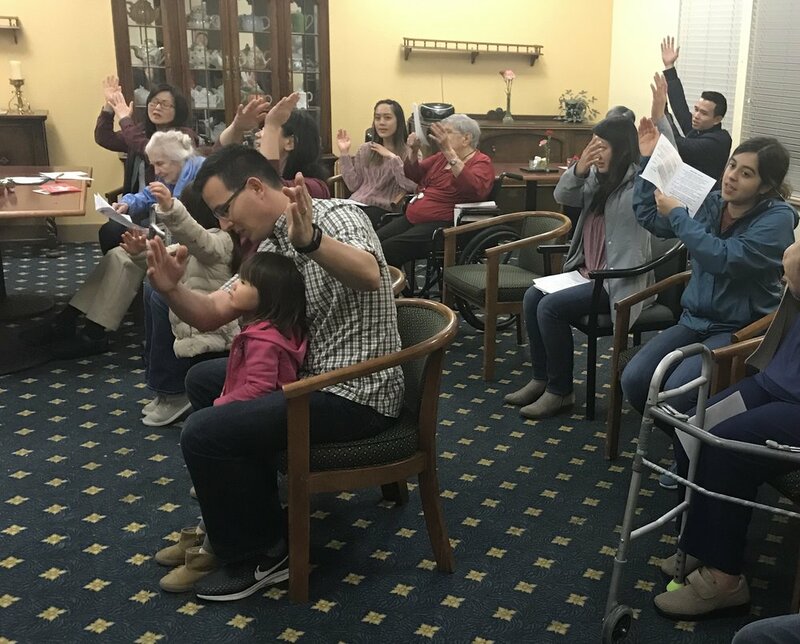 This past Valentine’s Day our church fanned out across 32 different Bay Area locations to spend time with the residents, sing together, and share a message of hope from the Bible. Many of the locations we visited were local convalescent homes and rehabilitation centers where the residents are suffering from different mental or physical ailments, but we also got to visit a few shelters and youth centers. Jana Fernandez leads praise time during her group's visit to a convalescent home in Oakland. Students from our Berkeley A2F fellowship visited a convalescent home in Berkeley. They sang "Your Love is Deep" with the residents and even included some simple hand motions with their song. Stephen Cheng delivers a message focused on how God's love overcomes sin and death. VDOC was started by a small group of women with an idea to visit a nursing home as a way to love those who are often forgotten. I’m sure none of them would’ve guessed that 13 years later, VDOC would take place at 32 different locations in the Bay Area, not to mention many more locations across our GP church plants. Students from our Rutgers ministry visited a convalescent home near campus and included a skit in their program. It’s cool to see everyone from our Element middle and high schoolers to college students, post grads, and parents with their kids all sharing in this vision of bringing love to the elderly on Valentine’s Day. VDOC has become an opportunity for parents to teach their kids how to show love to others, too. This past year, Outreach magazine even featured VDOC in their print publication in the hopes that other churches across the country would be inspired to start this ministry at their churches, too. We wholeheartedly agree!